I have new sneakers! Patent leather white sneakers! And I’m not a sneaker girl at all! I will explain why I bought them anyway. Because of my lung disease I get more and more problems with walking. And I don’t mean putting one leg in front of the other, but more distances. And with distances I mean that on a bad day 100 meters is already far and then it must also be flat. What doesn’t help either is that I always have to wear my oxygen concentrator, and that thing is heavy. Walking in heels is even harder. That is why I prefer to walk on flat shoes or boots when I have to walk or stand a bit. When we go out for dinner or I go somewhere in the wheelchair, the heels come out again. But I don’t have that many flat-heeled shoes yet. I don’t really like it either, but sometimes you have to let your mind speak louder then your (fashion) hart. Well I also had my mind set on a suit. Do you also use Pinterest for inspiration? It is really great. I knew that I wanted a suit with wide legged trousers and white sneakers underneath. Preferably with some gold-colored accents. I found the suit pretty quickly, it is light gray with a brown pinstripe. Pre owned. It fits like a glove! And the sneakers were also exactly what I was looking for. That hardly ever happens to me, I always have to make some sort of concession. Only when I received the sneakers did I see that they were patent. Even more better, because I love patent. I already had a pair of black ones! So I am completely happy with this outfit! My favorite of last week is: Amanda of Truly Yours, A. 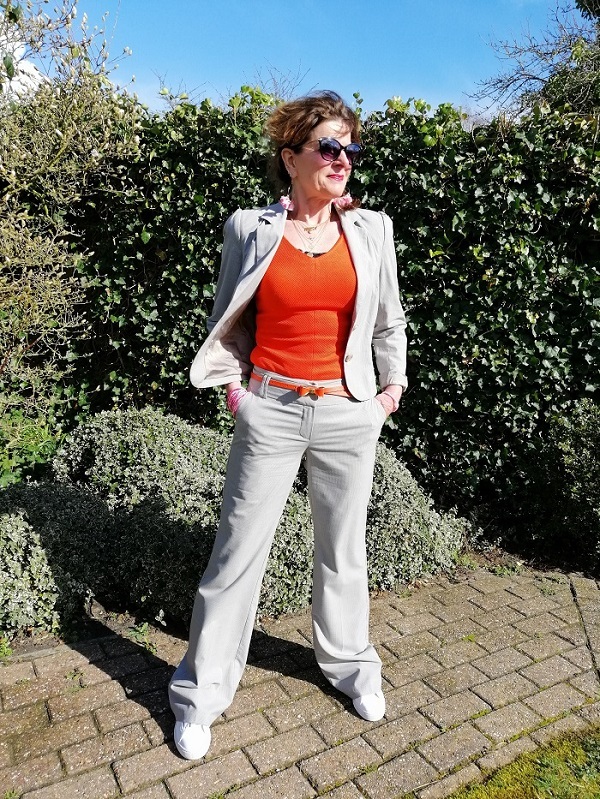 Previous Post Pencil skirt – boring or exciting? 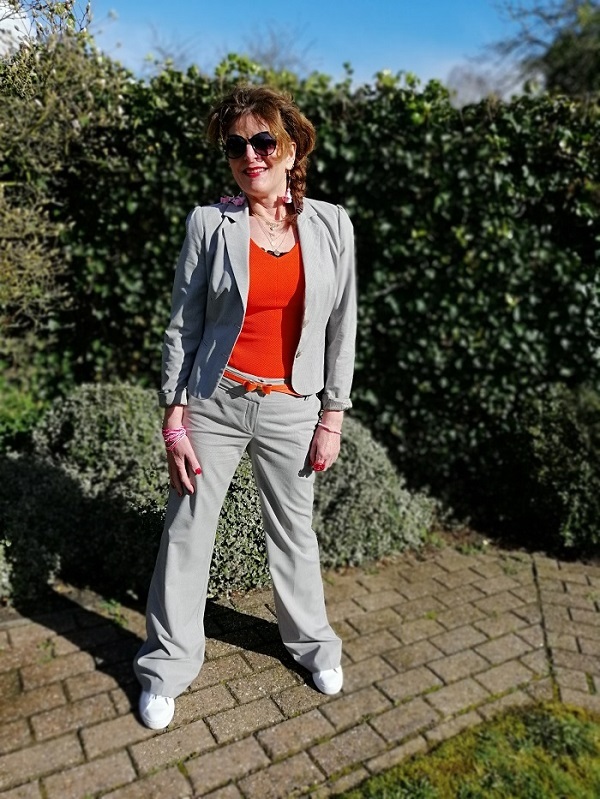 I wear sneakers with everything and I love the look of them styled with a suit! This is such a fabulous look! I love the orange shirt. Looks fabulous! I have the same feelings Laurie. With my petite frame and size, the suit would be too bulky (but beautiful it is). Love the look Nancy, the orange belt is such a clever little touch. I have sneakers but only wear them literally when I have to for walking, but with short legs I feel I always need a bit of a lift. Must try some athleisure type with a wedge because this looks great! Love that neutral suit. The pop of orange with it is perfect and love, love that cute little bow belt. You really have the coolest style! Each time I see one of your outfits, I am inspired. I wouldn’t have thought to pair the sneakers with the suit but it really works! Oh wow, what a compliment! Thanks! Y0u can still look stylish in flats, as you’ve proved here so well with the suit! 🙂 I live in flat shoes most of the time now, heels I still have a handful of but I tend to keep them for special occasions! Thanks Mica, have a great weekend! What a cool look Nancy, love the sneakers with the suit, you look terrific! Nancy, this outfit is amazing! I love the pants suit with sneakers. Super cool look. But more importantly, I love your enthusiasm and joy for life! Not allowing your disease to define every aspect of your life and seizing every moment with happiness! I adore you, my friend! Thanks! I appreciate that a lot! You look gorgeous in the pants suit and sneakers, Nancy. And, I love your poses! You bring such joy to your blog. Love it! This is perfect Nancy….a perfect way to combine function and style. I just adore that belt especially!! Thanks Lieske! I was a bit surprised by this outfit because I did not expect it to fit that good! It’s so hide your debilitating condition so well, Nancy, you always look so vibrant. Well done, you. 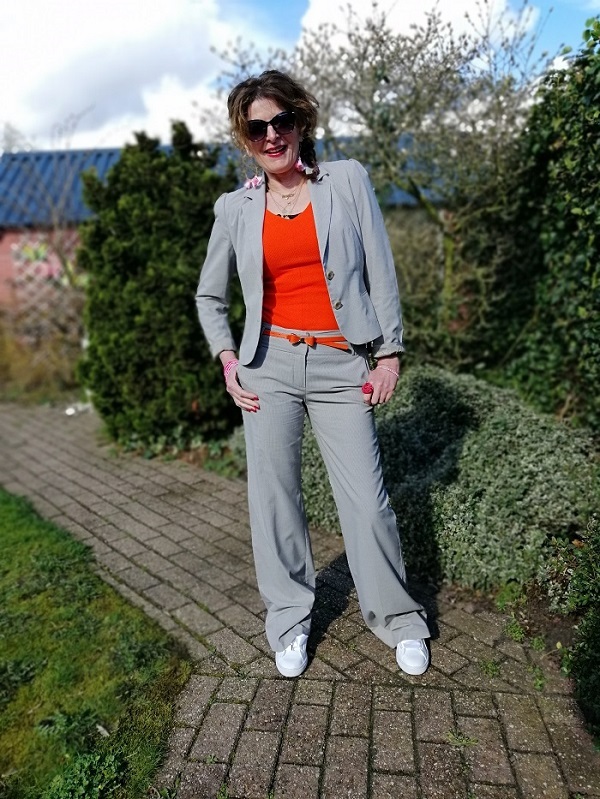 I’m not a trainers with anything normally but you’ve pulled it off with your trouser suit, in fact I hardly noticed the trainers so that says EVERYTHING about your vibrant personality! Hahha, oh thank you so much dear Mary. I guess because I don;t wear my oxygen tube while we are shooting that it is not so visual! Those shoes couldn’t be more perfect for you, Nancy! Patent, how fun! I’m amazed that the pre-loved suit fits so well, isn’t it nice when you don’t have to make any concessions? I know it’s hard to give up heels, and you have more reason than most. Wonderful to see you, my friend! Thank you very much Kim, that is a very sweet comment! 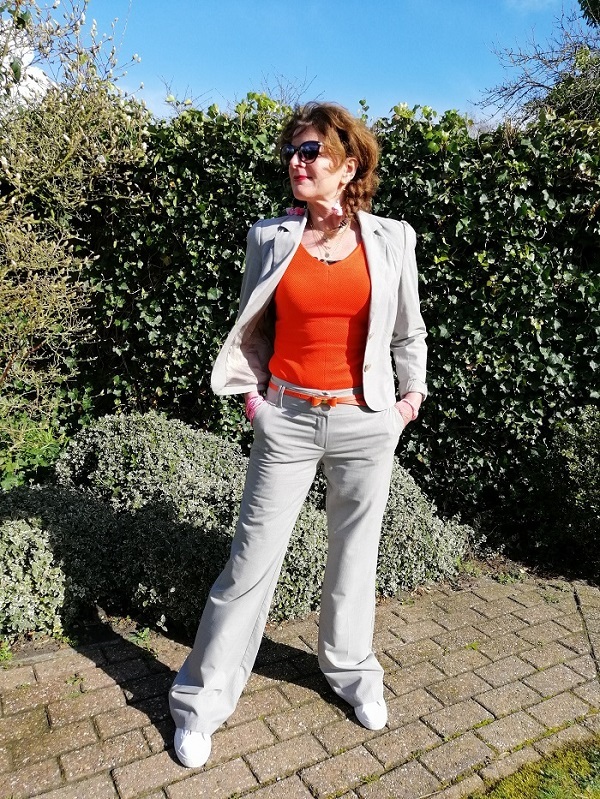 I’ve started to wear a lot more flat shoes too, Nancy, so this outfit really resonated with me – needless to say, I LOVE IT!! I recently ordered some sneakers very similar to yours. One pink pair and one black pair!! And in the past few weeks, I also bought two more pairs lol. I’m going sneaker mad!! Haha, but eh…..pink sneakers? Sounds great! No no no, now I want pink ones too! I love the laces on those and I love it with the suit. So smart! Thanks Jess! Enjoy your Sunday! I love the sneaker with the suit look. The orange is a great pop of color. Looking fab Nancy! You look lovely Nancy and the sneakers are great. I can’t wear heels anymore but I don’t mind as there are so many styles one can wear. I love how you’ve styled your suit with orange and sneakers—very cool! Oh it’s still chilly here so a winter coat isn’t that bad haha. Thank you Ann! The white paired with the orange is so fresh for spring. I look like a hobbit when I wear sneakers. As I age though I’m finding my feet are becoming more difficult to please. These sneakers look fab on you. Yeah, you are definitely a boot and heels girl! Thank Suzanne! Thanks! I am a bit of a matchy matchy girl! 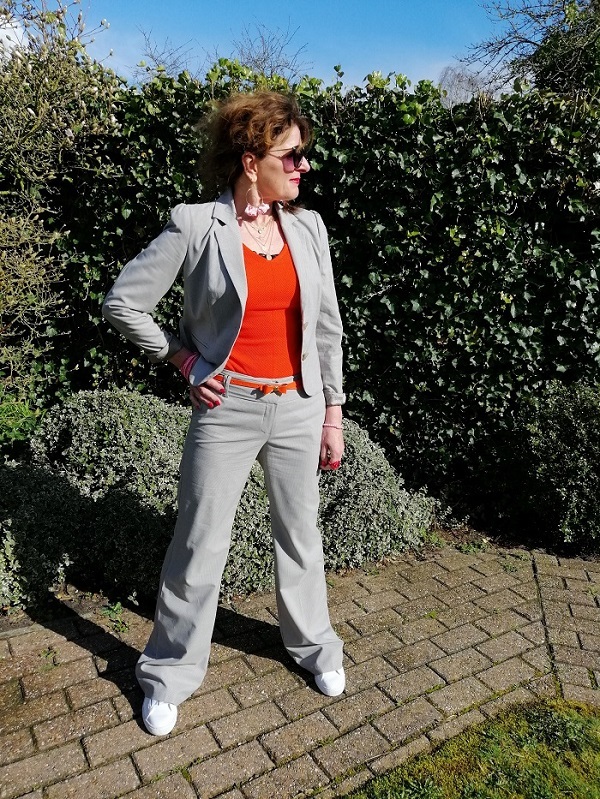 I love the grey suit with the bold color! Looks great with sneakers too! I have always been a fan of sneakers so yay, Nancy! These patent leather sneakers look so crisp and clean. Love how a white piece/item can do that! Your orange bow belt is really cute too. Such great styling Nancy! Thank you very much Maureen! I appreciate it! I love how you’ve made this suit more casual with tennis shoes! Orange is a nice color to pair with it! Nancy, I love that suit!! And the orange with the neutral tan just pops! Aren’t we all glad that sneakers are so popular?? At last we have comfort but are still in style!! Yes indeed! And I love how good they look on dresses too! Thanks Darlene! Looking very nice and thanks for hosting. I hope that you have a wonderful Sunday. Thank you very much! have a great Sunday! Thanks love! Have a great Sunday! Nice outfit & you look perfect. White sneakers are my favorite. Thanks for posting. I love how you added the orange belt to the outfit. I have been pinning sneakers like those. Im waiting to see if they come up at M&S. Love the look Nancy! 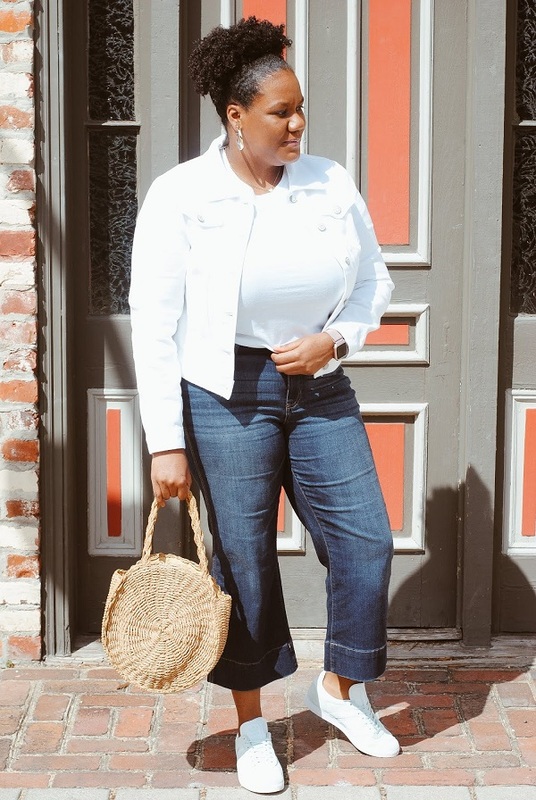 Sneakers are my all time favorite shoe so I’m loving them paired with almost anything. Thanks so much for the feature; it really made my week!! You’re looking so cute Nancy! I love a good pair of sneakers and my white ones get worn all the time! 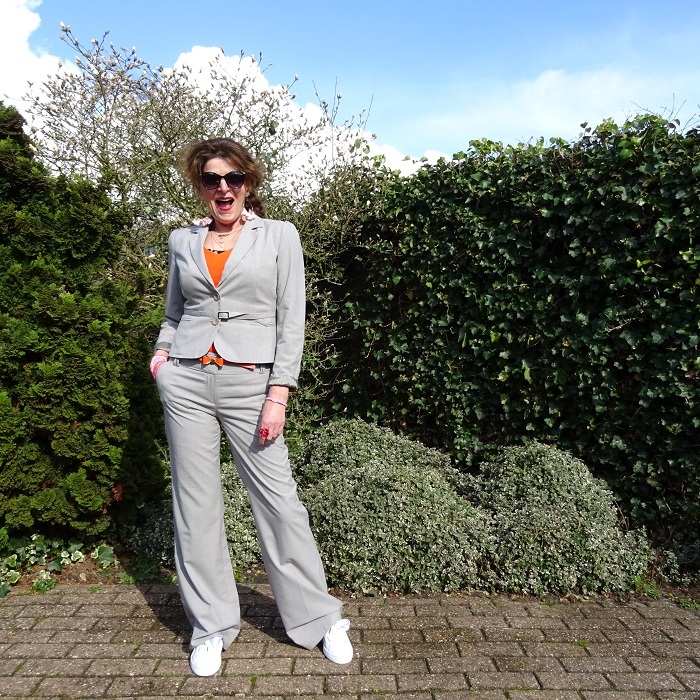 Happy to read that your suit is pre-loved – it looks fabulous on you, Nancy! I am not on board with the sneaker trend, but I do totally get the need for flat comfy shoes. I’ve been slowly transitioning myself to flat(er) heels. It’s not what I want to wear. I used to love high heels especially ankle boots with high heels! YOU my FRIEND are an INSPIRATION!! Thank you for linking up with me for Stepping Outside My Comfort Zone. Since we are new friends, I didn’t realize that you have lung disease. My dad had COPD. Is your problem similar? How very brave of you to share your struggles! Absolutely love your pep and vitality…your love for life and energy come shining through your photos. This outfit and this post are no exception. LOVE this look. I would like an upclose photo of those great sneakers. Do they have ribbon for the laces? They are charming. Patent leather!!??? Perfect way to dress up a sneaker and add some sass. My disease is called A.A.D and it causes COPD. You can read all about it in my ,,about,, page. And the laces are silky. Thank you very much Leslie! Very stylish outfit! I wear trainers a lot now as my feet hurt a lot. I think they look very cool with a trouser suit.